When it comes to food, I'm pretty much an omnivore and, while I tried to do the vegetarian thing a time or two in the distant past, I found it impossible to turn down a nicely prepared hunk of flesh when it was placed in front of me. But when I heard that there was some buzz around a vegan restaurant that had opened in the 'hood, I thought, "Hey, why not?" So when a flexitarian friend called and wanted to go out for lunch, it seemed the perfect opportunity to satisfy my curiousity. Since she was game, we headed down to the emerging retail hub that is North Williams Avenue (who would have thought?) to check out Nutshell. It's a loft-like space with wood, concrete and brushed aluminum as the major design elements, simple and spare, with a row of tables lined up against a wall opposite the very long bar that separates the diners from the open kitchen. The menu, created by chef Sean Coryell, consists of creative combinations of fruits, vegetables and breads that takes the brown rice-and-tofu reputation of most vegetarian restaurants and turns it on its head. 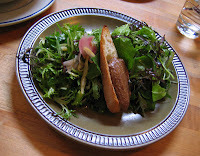 We started with a salad of microgreens from Mizuna Farms dressed with a citrus vinaigrette and topped with a nut butter crostini. 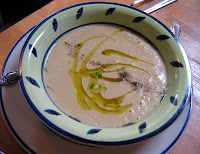 Alongside we had a bowl of vichyssoise made from root vegetables and drizzled with olive oil. Though the vinaigrette was somewhat overly tart, it did complement the smooth richness of the soup, which had an earthy quality that was a nice twist on the classic version. We also decided to share one of their lunch pizzas, which consists of a flatbread-type crust with toppings. 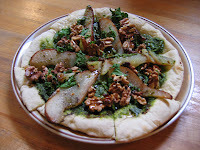 Ours came with sage pesto topped with slices of red pear and walnut halves, then drizzled with a reduced balsamic vinegar. Again, it was a combination of flavors I'd never had before, and a nice one at that, the herby richness of the pesto offset by the sweet pear and balsamic and the crunchy nuts. An odd item on the menu, at least in my limited experience, was the option of an order of bread with a choice of several extra virgin olive oils (all priced separately) and a selection of various salts (also individually priced). Go figure. They also have a nice selection of wines and beer by the glass, as well as the expected coffees, teas and smoothies. 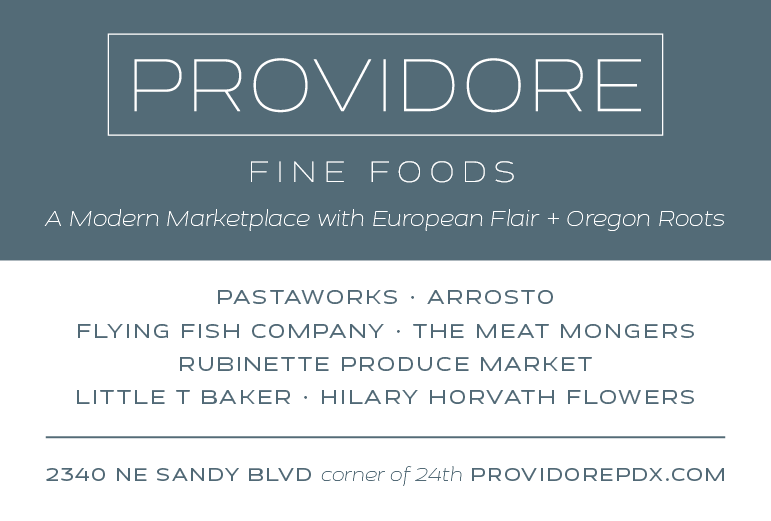 It's well worth checking out, especially for those with vegan or vegetarian friends and family members, and it's a great opportunity to try something you may not run into anywhere else in Portland. Details: Nutshell, 3808 N Williams Ave. 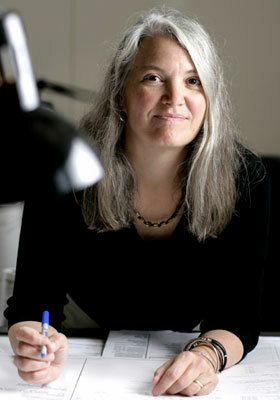 Phone 503-292-2627. Some vegan friends went there and were unimpressed, but because you, a meateater and foodie approve, I want to try it now. Hey, I'm an adventurous soul...it's always worth a shot! Flexitarian? I love this term. "I'm a vegetarian...oh, except for those times I eat ANIMAL FLESH." I've heard a lot of different rummblings about Nutshell. Both good and not so good. I'll have to see for myself. What you had looked and sounded yummy. I know...I love that word, too! To be fair, the friend in question doesn't do red meat or pork. She just doesn't like the taste. Me? Um...I'm more in the "if it's not still breathing I'll eat it" camp.